A tailored blazer with fitted jeans or a cozy fine-knit cashmere sweater worn with loose boyfriend jeans and heels. So long as the look is proportional, pairing a loose item with a more structured, tailored item, such looks can work, and work very well as you will see today. A shirt dress accessorized with a statement making belt cinching in the waist or a neutral over-sized sweater with skinny jeans and flats – each outfit works because the proper balance is struck. Enjoy perusing and happy shopping! White signifies spring and summer, and while I don’t adhere to the rule of no white before memorial day, when paired with a sweater, such jeans can be worn sooner than you think. Theory’s light blue linen blend sweater is a wonderful choice for spring, and while the Valentino satchel looks ideally paired with the outfit below, I’ve shopped a few more reasonable options to fit into the budget. Just read that article per your suggestion. Thank you for sharing. Intriguing indeed and definitely makes you think about choosing quality over quantity when building and then maintaining one’s wardrobe. Thank you. Thursday…”Style Inspiration” convinced me to get up and start the day…Kate’s look please. I swear this woman is living in Paris and I wish I could dress as effortlessly chic as she. Great choice! I love outfit no 7. Especially the sandals. I would love a low to mid heel like these for everyday wear. They are so versatile. #7. Would love to find that shirt. 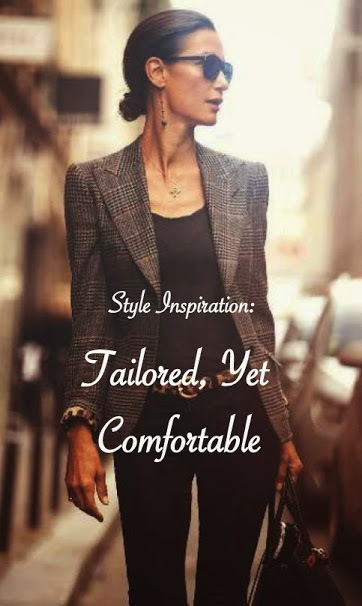 There are several outfits in this post that catch my eye, but number 1, the plaid blazer outfit is stunning, so is my pick of the week. Oh to be able to look that polished and pulled together–seemingly effortlessly! Look #1 is classic Jackie Kennedy! The classics never go out of style. Love the belt on the black dress…..a really great balance! Black dress is my pick! Boyfriend jeans and heels, one of my favourites. Some lovely looks. Casual yet chic. Like the combination of white jeans with nudes and pastels. Outfit #7 sandals and shirt …classic perfect and never trendy. Where can I obtain the sandals? I am convinced they would be a staple. Outfit #7 sandals and shirt are FAB!!! While I really enjoyed #8, it is a bit flow-y to say ‘tailored’ to me. #1 gets my vote because it is so well put together. All the details – from the sleek hair to statement earrings to adding an animal print belt – say ‘tailored, classy, and this lady knows her style’.